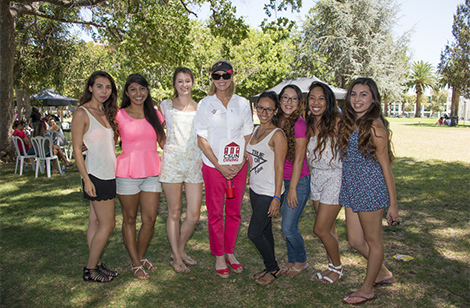 CSUN President Dianne F. Harrison hosted her annual welcome-back picnic with the help of faculty and staff volunteers who served up free food and treats to CSUN’s record-setting fall class of students. Read more about the President’s Picnic. CSUN professors capitalize on popular culture’s fascination with the undead — from The Vampire Diaries and True Blood to The Strain and The Walking Dead. Read more about this new book. CSUN’s newest faculty got an in-depth look at CSUN — from tips on creating a syllabus to helpful technology to icebreakers for getting to know their students — at the New Faculty Orientation. Read more about New Faculty Orientation. Fri, Sept. 12, 7 p.m. Sat., Sept. 27, 8 p.m.
President Dianne F. Harrison and the CSUN Alumni Association salute alumni employees at a reception at the the University House. Join colleagues from throughout campus in this free, convenient, after-work program that will help you achieve your fitness goals in a structured, friendly and fun environment. For Your Information this week features Rainbow Reception, Freshman Convocation and the Commit to be Fit program, as well as events, meetings, notices, classes and deadlines relevant to CSUN faculty and staff.